"Multi-Wave Mixing Processes - From Ultrafast Polarization Beats to Electromagnetically Induced Transparency" discusses the interactions of efficient multi-wave mixing (MWM) processes enhanced by atomic coherence in multilevel atomic systems. 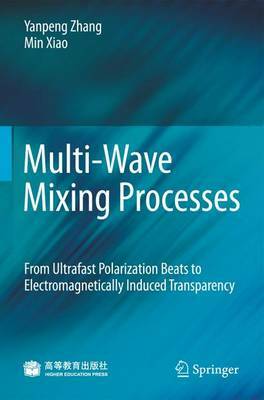 It covers topics in five major areas: attosecond and femtosecond polarization beats of four-wave mixing (FWM) processes; heterodyne detection of FWM, six-wave mixing (SWM) and eight-wave mixing (EWM) processes; Raman and Rayleigh enhanced polarization beats; coexistence and interactions of MWM processes via electromagnetically induced transparency(EIT); multi-dressing MWM processes. The book is intended for researchers, advanced undergraduate and graduate students in Nonlinear Optics. Dr. Yanpeng Zhang is a professor at the Key Laboratory for Physical Electronics and Devices of the Ministry of Education, Xi'an Jiaotong University. Dr. Min Xiao is a professor of Physics at University of Arkansas, Fayetteville, U.S.A.